Stephanie Hamilton is a NCCPA board certified and surgery certified physician assistant (PA-C), graduating from Trevecca Nazarene University with an advanced degree in medical science-physician assistant studies in 1998. She began her career as a PA in family medicine. Initially, she worked in many different rural settings including Indian Reservations in Oklahoma and Texas. As a Physician Assistant, Stephanie has always had a passion for volunteerism. She has volunteered many hours providing medical care to those who otherwise could not afford it. She also led a small group into the remote mountains of Mexico on medical mission trips in 2005 and 2006. In 2001, Stephanie joined the Army National Guard as a Medical Officer-Physician Assistant. Shortly thereafter, she was called up to active duty to serve our country in Operation Enduring Freedom and Operation Iraqi Freedom from January 2003 to April 2004. She was ranked Captain in an Area Support Medical Battalion. Stephanie was in charge of operating troop medical clinics in Iraq and Kuwait. She also felt it was important to go beyond the boundaries of the army compounds to promote improved public health. She was responsible for organizing missions into surrounding areas in Iraq to provide health education and medical care to Iraqi families and local sheiks. Stephanie was a recipient of the Army Commendation Medal for her service in a war zone. Upon returning to the states, Stephanie joined a plastic surgery practice and discovered her passion for aesthetic medicine. She is certified in multiple non-surgical facial rejuvenation procedures such as Botox, dermal fillers, chemical peels, PDO threads, sclerotherapy, fat reduction, body contouring and skin tightening treatments. With 13 years of experience, Stephanie continues to offer the most advanced and effective aesthetic treatments to her clients. She has mentored under two of the best injectors in the country and she regularly attends master courses to continue to advance her skills as an aesthetic practitioner. Two years ago, Stephanie embarked on a journey of opening her own private practice in the city of Palm Beach Gardens. At Hamilton Aesthetics of the Palm Beaches, Stephanie and her team pride themselves on offering a relaxing atmosphere, professional customer service and the highest standard of care. She successfully performs aesthetic procedures such as Botox/Dysport, dermal fillers, Sculptra, lasers for skin rejuvenation, advanced foam Sclerotherapy and skin care. Stephanie enjoys educating patients on the aging process and customizing an “aesthetic journey” for every individual client. Her goal is to achieve amazing natural looking results. Stephanie has an experienced and great aesthetic eye and loves being an integral part of empowering others to feel beautiful and to be confident. Stephanie has been an active member of the Palm Beach Gardens/Jupiter area her entire life and currently resides here with her amazing husband and beautiful daughter. Stephanie feels being philanthropic as a business owner is important. She is dedicated to giving back to the community by supporting several local and national charities. She also mentors student physician assistants interested in entering the field of aesthetic medicine. Stephanie is the former host of a live weekly talk show called Combat Aging on 95.9 The True Oldies Channel and 106.9 on the Treasure Coast. This allowed her to offer professional expertise on the secrets to fight aging with her listeners. Stephanie has always been a patient advocate and feels educating her patients on all the options available to them is so important. She has always prided herself on giving her patients just what they need, nothing more and this is why her patients trust her. 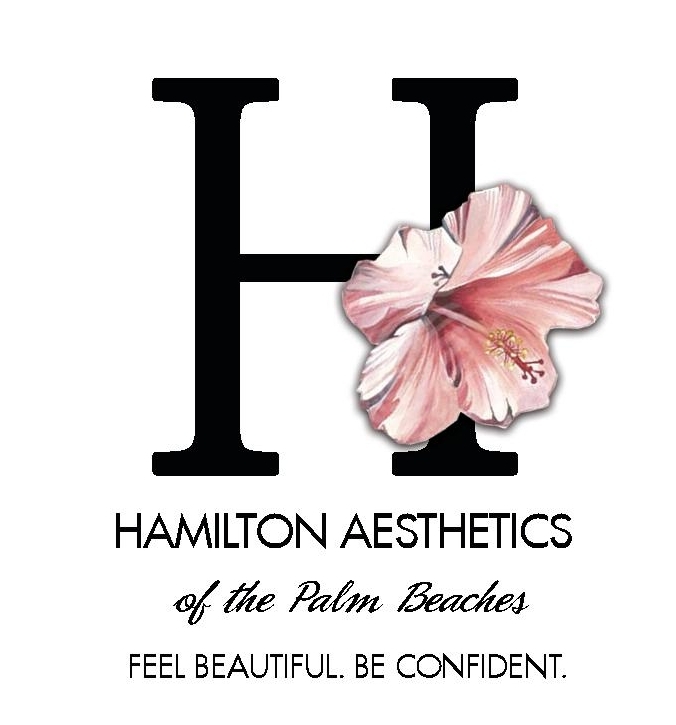 Thank you for your interest in Hamilton Aesthetics of the Palm Beaches. A member of the Hamilton team will call you to schedule your free consultation. Please call (561) 366-7772 or fill out the contact form below to request an appointment and a member of our team will get in touch with you shortly. A member of the Hamilton team will call you soon to schedule your free consultation.